There’s a common line of thought among many Christian preachers and speakers that we ought not to criticise one another’s sermons, especially in a public arena such as the internet. In disagreeing with this point of view, I want to distinguish between two things: critiquing the content of preaching and making a personal attack on the preacher. I want positively to encourage the former and resolutely resist the latter. Too often Christians confuse these things and too often we respond to points of view that we “don’t like” by sliding into criticisms of the person who espoused them. There are two unfortunate consequences of this: the ideas raised in the message remain undeveloped, and people get hurt. Even when we experience a sermon which is well constructed, persuasively delivered, theologically sound and ticks all the boxes in its use of stories, visual aids and rousing rhetoric, we are often content to say “great sermon!”, but within a few days have all but forgotten what exactly was great about it. It seems to me that if we learn to focus on the content of preaching and remember to act with respect and care towards the person doing the preaching, then constructive, thoughtful criticism can only do us good. So, for example, in the past at my own seminars at the Baptist Assembly, I have made a deliberate point of questioning some of the things said from the main stage. I am not out to attack any of the speakers but I do want to encourage careful consideration and reflection of some of their proposals. I think our preaching suffers when it cloaks itself in a sacred, defensive force-field. It becomes flip, clichéd, patronising and, eventually, way off the mark. The to and fro of friendly but committed conversation is, on the other hand, a good way to generate insight, refine ideas, develop communication skills and keep it real. Indeed conversation on a blog is one way of having such a discussion. Our preaching suffers when it cloaks itself in a sacred, defensive force-field. It becomes flip, clichéd, patronising and, eventually, way off the mark. It is worth bearing in mind though the nature of online/blog discussions. It seems to me they fall somewhere in between careful public statement and off-the-cuff, knee jerk responses, but definitely tending much more toward the latter. For those of us who take part in online conversations we should remember that our comments will be overheard by a wider audience than those who join in the comments, so the potential to hurt other people is far greater than we may realise. I have been guilty of this myself. It’s always worth a final read through your comments before hitting the “submit” button. And lastly, please let’s try and cut each other a bit of slack. What we are engaged in (I hope) is trying out ideas so as to refine them – together. The things we express will be provisional, notions under development, not final conclusions or settled opinions. We will rarely express ourselves with precision. Even when we take care we will, from time to time, use turns of phrase that might offend someone out there. It’s going to happen so let’s be gracious when others get it wrong and let’s learn to apologise when we ourselves screw up … And remember, sometimes taking offence too easily causes as many problems as giving offence. So please, please feel free to criticise my preaching, my lectures, my seminars. And please learn to welcome critique of your own preaching. 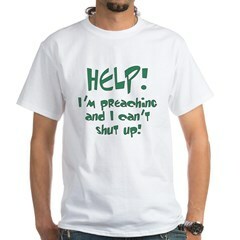 We preachers get to shoot our mouths off in public far more than is good for us; it can’t hurt to have what we say exposed to friendly scrutiny. Try not to be unkind, try not to get easily upset, and together we might just learn a teeny bit more than we would if one person did all the talking. What do you think? Chris Goswami is Director of Marketing for a Silicon Valley based company, Minister In Training in the UK Baptist Church and Blogger of the Year. His personal site iswww.7minutes.net where this blog first appeared.